The TeraFlex JK/JKU Rear Performance Big Rotor Kit is an affordable upgrade for JK Wrangler and JKU Wrangler Unlimited models requiring increased braking performance with oversized – and heavier – wheels and 33-35” tires. This simple bolt-on upgrade doesn’t require cutting or welding. 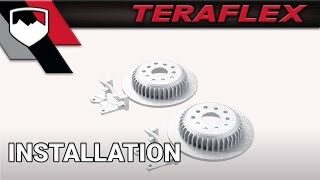 • An 8-lug option is available but must be purchased in combination w/ the TeraFlex Full-Float Kit (# 3043000 or # 3043200). • for more heat dissipation Rear Performance Slotted Big Rotor Kit (# 4304460) is also available. When I add the rear brake kit to the front brake kit it made the world differents how the Jk stops normal.